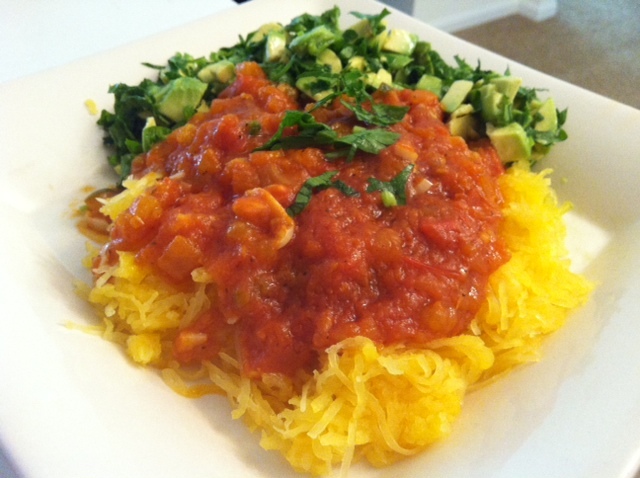 I love spaghetti squash ever since I was introduced to it by a friend. I can’t help but say “Subhan Allah” [Glory and Praise to the Creator Allah] every time I come into contact with spaghetti squash and cook it. You will see what I mean once you handle one. 1) half of a medium sized spaghetti squash [halved length wise] with skin on, Since it freezes well, you can freeze the other half for a later time. Pre heat oven at 400 degrees Fahrensheit. Drizzle olive oil and sprinkle sale on the inside of the squash. Place face down on baking sheet and bake for 30 minutes or until soft. When warm scrape with a fork and marvel the vibrant colored spaghetti. Subhan Allah ! Place on a plate and keep warm. 1) 2 medium tomatoes with skin removed [pierce the skin with a knife and place in hot water for a few second and skin will come right off]. Diced. In a frying pan under medium heat add olive oil and garlic and sautee for a few seconds [be careful it doesn’t burn or else it’ll become bitter]. Add the diced tomatoes and green chilly peppers, add salt and let cook for 2 minutes. Add the tomato paste, salt, and 1/4 cut of water and let cook until it becomes somewhat thick [about 4 minutes]. Turn off and pour on spaghetti squash. Serve with a side of avocado and parsley. Just toss one diced avocado+1/2 cup of finely chopped flat leaf parsley+ 2 tsp of olive oil+2 tbslp of lemon juice+ salt to taste. Enjoy.